I will not called this an extravagant dish and this is definitely not a common dish that you will find in your local Chinese takeaway or any other typical Chinese restaurant for that matter. 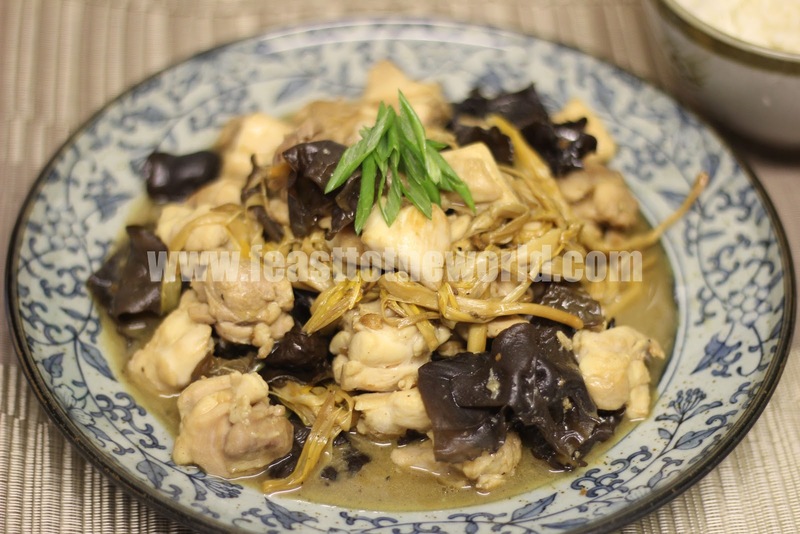 This dish has a very humble history, it is a down to earth home cooking dish that my mum would rustled up very quickly for dinner in a hurry when I was young. In a typical Chinese household, it is not unusual to find an abundance of dehydrated ingredients such as shiitake and wood ear mushroom, tiger lily buds, dried shrimps, anchovies,bean curd skins, etc being kept in the kitchen cabinet. All these might sounds exotic to the western world but were absolutely vital in creating a wonderful arrays of simple home cooked dishes. This was a fine example of one such dish. One noteworthy of this dish though was the technique that is commonly used in Chinese cooking to provide the meat with a smooth, tender and velvety texture known as 'velveting'. This was a crucial step in many delectable Oriental stir fry dishes. No bonafide Chinese cook would ever dared to skip this for fear of delivering a dry and insipid meat, especially when the whole success of the dish relies heavily on the finishing texture. And in true spirits of how my mum would have cooked this dish, I had faithfully stay true to the method. 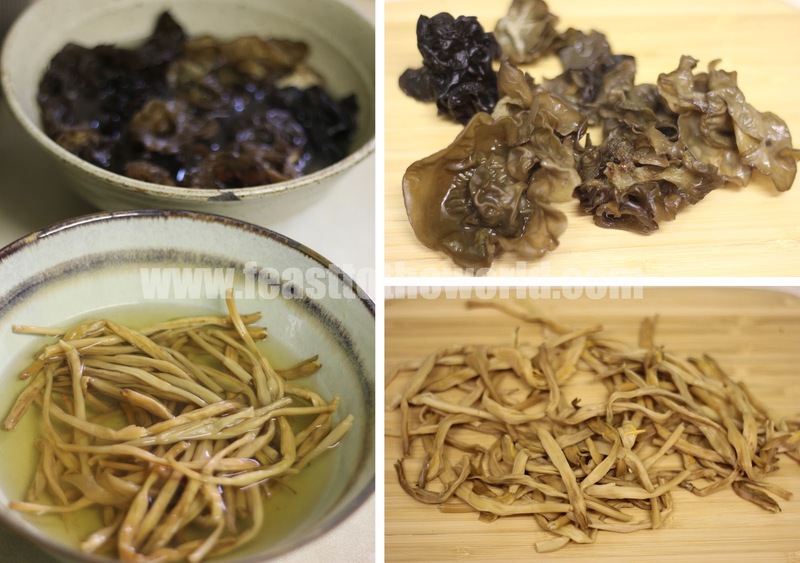 Soaked the wood ear mushroom and tiger lily buds in warm water for 30 - 40 minutes, until soften. The wood ear mushroom will double in size and the tiger lily buds will plump up. Drain both and squeeze out any excess water. 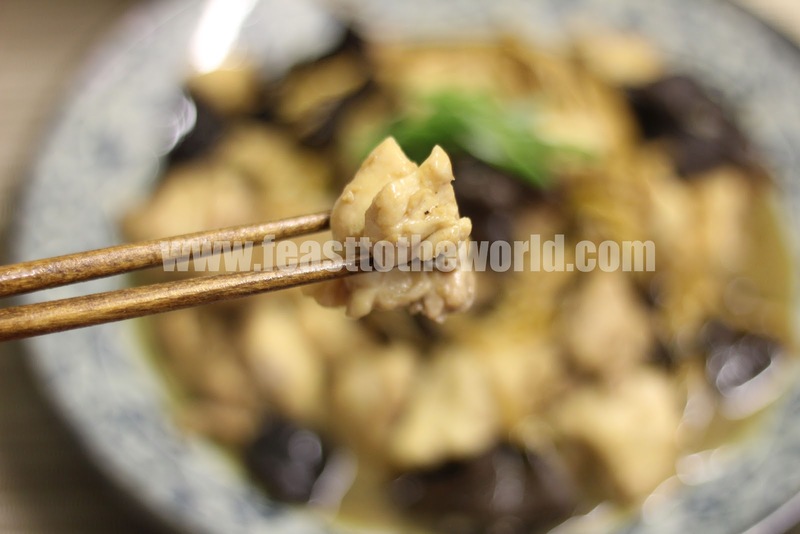 Cut the mushroom into smaller pieces and set aside along with the tiger lily buds. Combine the chicken with the marinade in a large bowl, mix thoroughly and leave to marinate for at least 30 minutes. After this time, heat up the oil in a wok over high heat until smoking. Add the chicken and toss in the hot oil for 30 seconds, until the chicken began to turn white in colour. This is called a 'velveting' process. Remove the chicken and drain on some kitchen towel. Pour away all but two tablespoon of the oil and return the wok back onto the heat. When the oil is smoking, add the garlic and stir fry for 30 seconds, until fragrant and add the chicken along with the wood ear mushroom and tiger lily buds and stir fry for another minute. Add the oyster sauce and water and bring to the boil. Cooked for a further 3 minutes, until the chicken is cooked through. Add the cornflour mixture and stir well into the sauce, it should thicken up almost immediately. 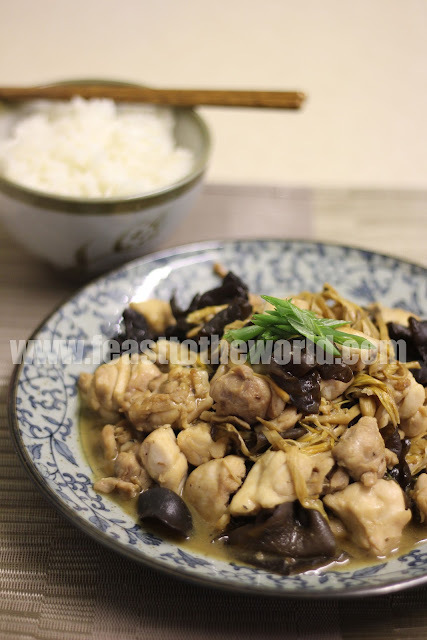 Season with the black pepper and finish off with the sesame oil, stir to mix well and immediately remove from heat. Transfer to a clean serving dish, garnish with the spring onions and served with some steamed rice.